Ben: So. That was bittersweet. I want to say up front that I know that the direction the show went in its last season didn’t agree with everyone. They went to some weird places and were not afraid to take chances with characters and the overall direction of the show, and are entirely unapologetic about it. I know that my personal feelings about the show don’t reflect everyone’s feelings, I acknowledge that other people might have taken away different things from the show than what I took away, and I don’t in any way intend to belittle people’s feelings or thoughts with what I have to say. 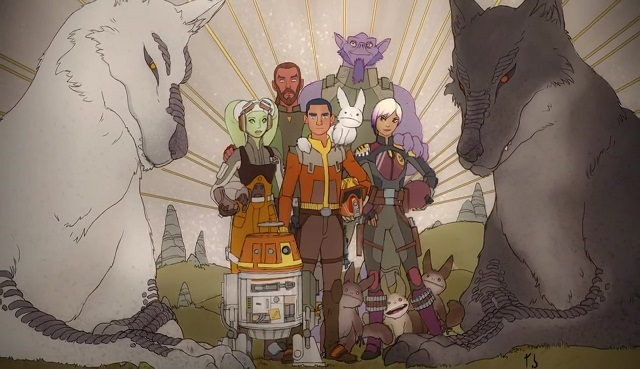 I’ve watched every episode of Rebels as it’s come out, I’ve been fully invested in the show since before it even started airing, and it’s been the one major constant about the franchise in general that I’ve been attached to since the Disney acquisition. The very first article I ever wrote for this site as a staff member (that hasn’t aged well but I digress) was in defense of Rebels from malingers who were badmouthing it before an episode had even aired. My time with the show has not been all sunshine and rainbows, and I am fully willing to acknowledge that the show is flawed. All of that being said, the last fifteen minutes or so of the final episode made me so emotional that I was literally trembling. I’ve been invested in the crew of the Ghost for four years, and having their story finally come to an end is something that I intellectually knew had to happen at some point, but that I was not fully emotionally prepared for. I want there to be more. I want to tune back in next week and have another adventure with Sabine, Ezra, Zeb, Hera, Chopper and Kanan ready and waiting for me. I want to see more of Lothal, I want to get more banter and fun, I want to learn more about each of these characters, I want to see them keep interacting, keep fighting, keep living. » Read more.. So this week brought us two episodes, but let’s be honest, there’s one major focal point of the two of them: the Lothal Jedi Temple and the fact that it can transport people through time and space. To say that this raises a lot of questions is an understatement of the highest order. We can start with how it’s handled in the episode itself, of course, before going into the possibilities that this might open for Star Wars storytelling in the future. Strap in folks, things are going to get very weird. The main purpose of the temple within the context of the story and the characters within that story is to teach Ezra one last lesson before the show’s conclusion: letting go. It’s far from the first time we’ve seen a Jedi have to learn this lesson, but Ezra’s situation is very poignant, in that he’s dealing with the death of his Master and surrogate father. Kanan and Ezra’s relationship is one of the closest of any two characters in Star Wars Rebels, so of course when he’s presented with the possibility of doing something to save Kanan’s life he jumps at the chance. But Rebels twists the script a bit by making Ezra’s temptation not based on the dark side like Anakin’s was once upon a time. This is not some temptation that will lead him down a dark path that will forever dominate his destiny. Ezra is presented with an opportunity that is entirely neutral from a moral standpoint, a literal door through which he can walk to Kanan’s side as the fuel tank explodes. No strings, no dark voice whispering in his ear tempting him with unlimited power. Just reach out, and pull him through. Of course, it isn’t that simple. If Ezra does save Kanan, it would be at the cost of his own life, and the consequences of that sort of action on the rest of the team would be incredible. Not to mention the timeline of events after Kanan’s death with Ezra already present would create a paradox that may have unimaginable consequences. Faced with these realities, Ezra is forced to stand aside and watch, again, as Kanan dies. » Read more..
Mike: Well, you can debate whether or not this was inevitable—lord knows we have—but you can’t debate that it’s happened: Kanan Jarrus is no more.1 There are two angles, I think, from which to discuss this development—did it really need to happen, and did they handle it well? I reject the notion that it was absolutely necessary from any sort of continuity standpoint, but I do think in the context of this story it’s dramatically justified. 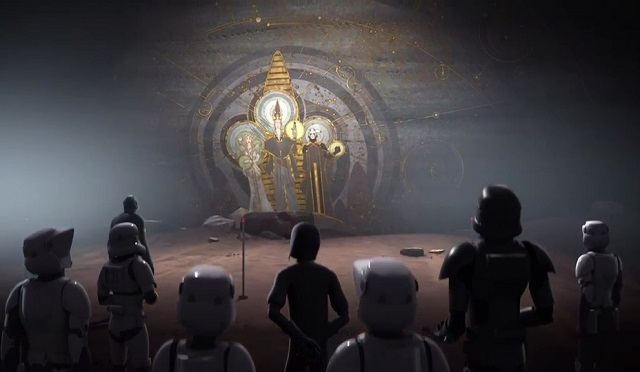 And since fans have been perfectly happy to spend the last few years debating whether Kanan should die, I’d rather not rehash that again here, and instead focus on how he died, and whether Star Wars Rebels managed to earn this moment that, arguably, they knew all along was going to happen. Just in terms of the artistry involved, the score, the pacing, the characters’ reactions, I thought it was beautifully and naturalistically done rather than some kind of idiot-ball situation where the plot gods reached down and smooshed him because they wanted to (though okay, I could argue that his eyes randomly healing for two seconds was a smidge over the top). But while I never didn’t like it, the more I think about it the more I appreciate how it seems to fit into not just Rebels‘ larger narrative but the overall Star Wars story at this point in time. In the heat of the moment, and with a couple months off between this episode and “Rebel Assault”, it’s easy to forget how important the TIE Defender factory has been to the last couple seasons, and underestimate how big a deal it is for Pryce to effectively destroy it just to take Kanan down. Both “Jedi Night” and “DUME” even take the extra step of establishing a competition for resources between Thrawn’s Defenders and Krennic’s Death Star project, meaning that the films could have gone very differently with that factory operational and Thrawn coming out on top. And speaking of Thrawn, it sure looks like his and Pryce’s happy working relationship has come to an end—once again, he’s undone not by his own failure but by the rash decision of an underling. Whether Thrawn or Pryce emerge from this mess intact remains to be seen, but unless Rebels gets too wrapped up in Mortis shenanigans to give this plotline a satisfying payoff, I suspect Kanan’s messy demise will prove to be one of the most important events the show has portrayed—and thus, I’d call it very much earned. » Read more.. So with the reboot clearing away Jedi aspirant BoShek and Death Star IG-88, I went into FACPOV expecting more emphasis on basic storytelling and less on “the tallest Jawa is really Boba Fett”. And by and large, I got that—but even now that I’ve read the whole book, Omi still stands out to me. As I said in our group piece on FACPOV, some of my favorite stories were the ones in which a bit player furthers the heroes’ quest not because the Force demanded it but out of a simple act of kindness (which from a certain point of view is the Force’s way of demanding it). As it happens, the new R5-D4 story, “The Red One”, is maybe the perfect example of this: Arfive is hinted to have some rebel connection in his past, but he isn’t anything special, and he doesn’t receive any visions that convince him to let Artoo take his place; indeed, to do so almost certainly means consigning himself to the scrap heap. Nevertheless, Artoo makes his case and Arfive simply chooses to believe him—and is rewarded for it with at least a slim chance of survival. » Read more..
Ben: Two major things happened “between” this episode and the last episode: Hera apparently got a promotion after basically cussing out Mon Mothma and the other Rebel leaders, and a squad of X-wings came out of nowhere. I understand the need for narrative velocity in a show that only lasts twenty-two minutes and has a cut-down episode count for its last season, but c’mon. 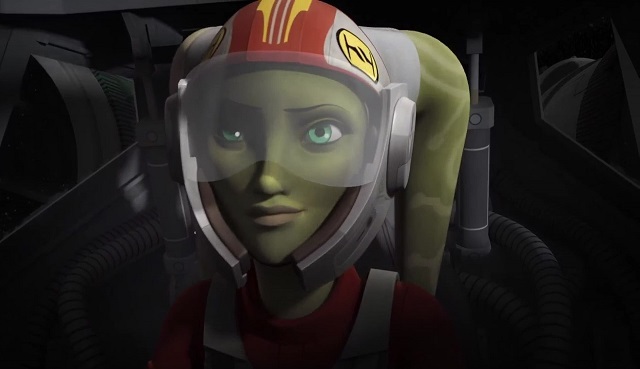 It’s been almost a year since we learned that Hera was even getting a promotion, and now that the show has reached that point it happens off-screen? It’s pretty obvious at this point, and should have been obvious before, that they’ve had to trim a few corners narratively to get to the finale at the end of this season. Again, this is a trimmed-down season as it is, and they’ve already crammed a lot in. But some of the corners that they’ve cut are the wrong ones, in my opinion. On the other hand, this episode gave Thrawn a pretty solid victory, which I think has gotten lost in a lot of the discussion about it. He successfully predicts not only the attack, but that the Rebels would be tenacious enough to pierce the blockade despite everything, so he kept most of his fighters in reserve and then slaughtered the Rebels when they thought they had already been through the worst. He even had Rukh capture multiple downed pilots, including Hera herself. That visual of seeing all of the X- and Y-wings raining down on the city was really, really nice. » Read more..